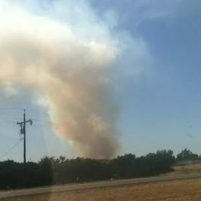 A fire that started Wednesday afternoon at Camp Roberts has burned about 500 acres. Cal Fire is assisting Camp Roberts in fighting the fire from the air and the ground. The fire is burning grass and oak woodlands. The fire broke out south of an area that was scheduled for a planned burn on Thursday. Fire official said there is no estimated time yet for containment.